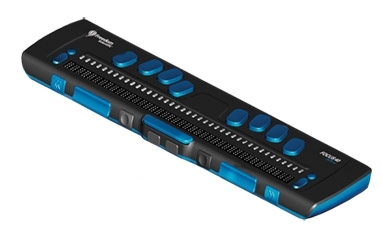 The new Focus 40 Blue is a refreshable braille display that combines the latest Braille technology, the most user friendly keyboard and control layout, and both USB and Bluetooth connectivity in an extremely lightweight and compact design. Use the Focus 40 Blue with BrailleIn to enter contracted Braille, switch to display modes such as structured and line mode, or perform all keyboard commands for complete control of your PC. The comfort and response of the refined Perkins-style keyboard permits hours of effortless Braille text input. Advanced navigation features allow quick movement around documents with natural, efficient hand movements for greater productivity. Read documents and e-mail, work with spreadsheets, and surf the Web – never moving your hands from the Braille display.